HOLD*BLAST™ Surface Passivator | Gonneville Inc.
For use in a solution with water. Surface corrosion can occur when water wet surfaces react with atmospheric oxygen. This results in the formation of flash rust, which can be limited with the use of HOLD*BLAST. This product passivates the surface to stop the formation of surface rust for long periods of time, often several days. • HOLD*BLAST costs only pennies per square foot. • No need for high cost deionized or high purity water. • Use a 1:50 dilution, depending on the quality of water, a higher dilution may be possible. As a surface passivator, HOLD*BLAST CHEMICALLY CHANGES the active surface of metal to a MUCH LESS REACTIVE STATE. Effectively passivates the surface and is a cost effective, environmentally safe and compatible with all coatings. A surface passivator which stops the formation of flash rust for long periods of time, often several days. Surface corrosion can occur when water wet surfaces react with atmospheric oxygen. Prevents the formation of flash rust, by chemically changing the active surface of metal to a much less reactive state. This liquid is a concentrated organic chemistry which is added to water and sprayed onto surfaces during preparation for coating. It does not leave a film or residue to interfere with coating adhesion. Removes dust as it passivates and is a cost effective, environmentally safe and biodegradable product. Dissolves all mineral salts found in potable water. No need for any high purity and high cost water for dilution. Simply dilute in potable water. Leaves no residue or scum on the surface on evaporation because all minerals are dissolved, such as calcium carbonate. Many specifications require no flash rust. This product will help meet that specification. Flush with clean fresh water. It is not necessary to use entire contents. Partially filled containers should be closed tightly. CLOR RID International Inc. warrants this product to be identical in chemical and physical properties from batch to batch within specification limits of the raw materials used in their manufacture. KEEP OUT OF REACH OF CHILDREN. Do not mix with other chemicals. S.D.S for full precautions prior to use. Professional use only. Steel surfaces, when wetted, typically flash rust due to a variety of reasons, yet a flash rusted surface often is not acceptable. HOLD*BLAST is an easy to use, economical product that stops flash rust from occurring, yet does not leave a film or residue to interfere with coating adhesion. 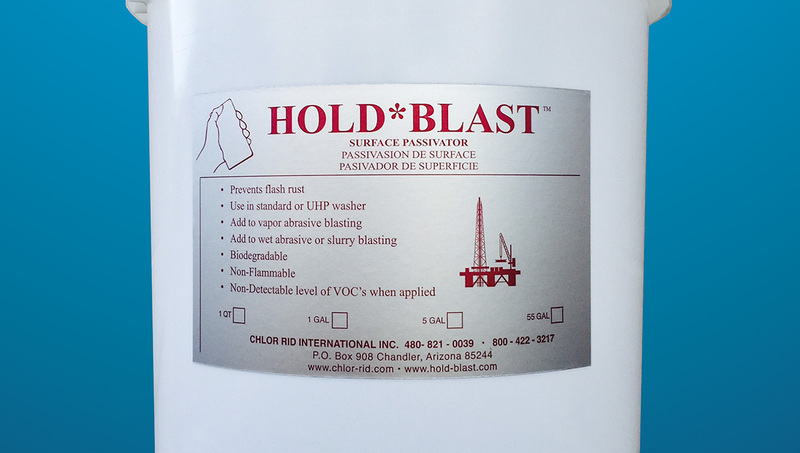 HOLD*BLAST is formulated specifically to passivate a metal surface. HOLD*BLAST’s biodegradable formulation temporarily changes the active surface of metal to a less reactive state for long periods of time, often several days. It does this by forming a temporary monomolecular layer, preventing the metal surface from reacting with the atmosphere above the substrate; hence stopping the oxidation of steel. Will it leave a residue? Unlike other products on the market, HOLD*BLAST passivates the surface and is not a film-former. Its chemical components are biodegradable, non-hazardous, and it is a safe and effective alternative to film-forming chemicals. Surfaces treated with HOLD*BLAST do not need to be rinsed. The thin, temporary hydroxide layer formed on the metal substrate will not interfere with coating performance or adhesion. IS HOLD*BLAST COMPATIBLE OR APPROVED? Because HOLD*BLAST does not leave a residue on a surface there are no compatibility concerns. There simply is no residue or concern with regard to compatibility. Coating manufacturers like our products because they provide cleaner surfaces for coating application. WILL HOLD*BLAST REMOVE SALTS FROM A SURFACE? Industry professionals are becoming increasingly aware of the importance of removing salt contamination from surfaces prior to coating. 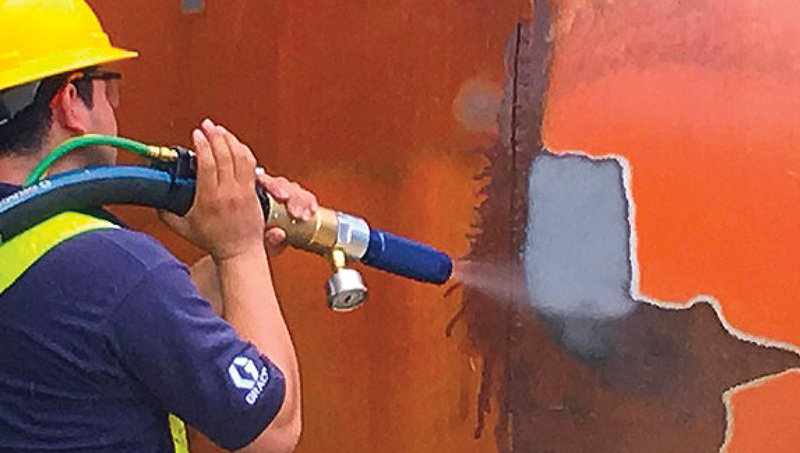 Abrasive blasting alone is insufficient to remove chlorides, sulfates, nitrates and other problematic soluble salts which have become adsorbed on the surface. Though water alone will remove some minor amount of salt, HOLD*BLAST is an alkaline treatment for passivation of surfaces, not for salt removal. CHLOR*RID, a mildly acidic product when applied, is functionally specific for disbonding and removing salt contaminants. WHY USE HOLD*BLAST VERSUS PASSIVATION PRODUCTS? HOLD*BLAST is more economical to use than other products, and does not need to be combined with more costly reverse osmosis or De-ionized water to work effectively. Also, unlike other passivators in the marketplace, HOLD*BLAST will dissolve minerals (such as Ca and Mg) commonly found in potable water. This feature allows many contractors to regularly use our product in HP and UHP equipment with great success. WHEN IS HOLD*BLAST TYPICALLY NOT RECOMMENDED? A surface which has been passivated with HOLD*BLAST will flash rust if wetted by rain or condensation, for example. Therefore, if the passivated object will be in a wet environment it may not be advisable to use this product. If a surface is heavily contaminated flash rusting may occur. In use with vapor or mist blasting equipment, it is recommended to start with a mix of 1 gallon of HOLD*BLAST per 50 gallons of potable water in the holding tank. Lower concentrations may be suitable depending on the circumstances and type of mist/vapor blasting equipment used. No rinsing is required, but if the surface is to be rinsed, such as to remove particulate matter, the same 1:50 solution is recommended. (Poorer quality water can be used, but may require a higher concentration of HOLD*BLAST.) Do not mix with other chemicals. After the substrate has been thoroughly blasted, it should be allowed to dry prior to coating application. Remove any excess or ponded water using compressed air or other means. Typical time for “holding the blast” is approximately 72 hours. Don’t let salt contamination ruin your project and your reputation! Before application of HOLD*BLAST, surfaces should always be tested to assure soluble salt levels meet or are below the acceptable level. 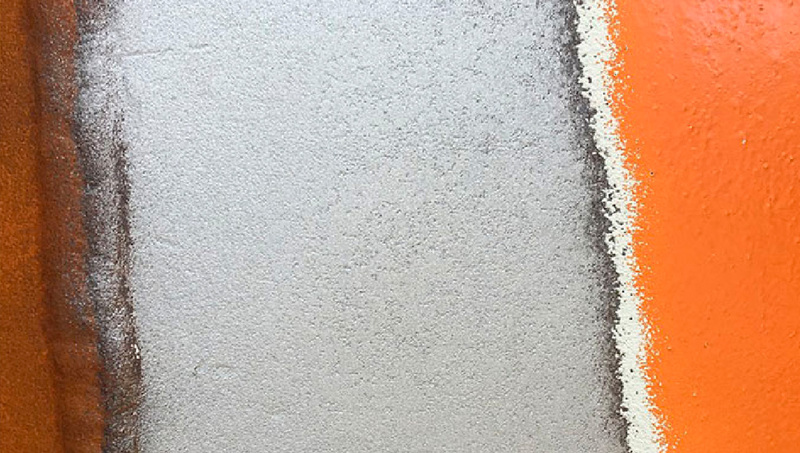 (Testing after the application of a passivation [flash rust prevention] treatment may mask the presence of surface salts under the blanketing layer formed.) High levels of soluble salts can cause premature coating failure and degradation of the substrate. Should high salt levels be encountered, it is strongly recommended to perform the mist blasting with CHLOR*RID added to the mist water in a 1:100 dilution, followed by a rinse down with HOLD*BLAST added to the rinse water in a 1:50 dilution.